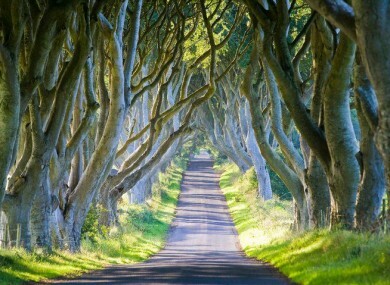 The Dark Hedges in Ballymoney, Antrim. GAME OF THRONES played a large part in the growing number of US tourists travelling to visit Ireland as it emerged over 1 million people from the States came here last year. Fáilte Ireland this week published its preliminary ‘Tourism Facts’ for last year which showed that, while Britain is still our largest market for overseas tourism, there has been a large increase in the number of people coming from farther afield. Britain remains our biggest source market for overseas tourists, representing 41% of all such visits. The next biggest source market is mainland Europe, which accounts for 36% of international volume. 17% of overseas tourists come from North America. The balance, 6%, comes from other long haul markets. This can be put down to a number of initiatives launched by both Fáilte Ireland and their colleagues in Tourism Ireland. Fáilte Ireland’s head of research, Caeman Wall, said the comprehensive reference guide for tourism in Ireland provides them with the necessary insights for planning and developing future tourism. He said: “For example, this year’s Tourism Facts 2016 tells us that while Britain remains our largest source market for overseas tourism, mainland Europe is delivering more holidaymakers. Earlier this week, Tourism Ireland’s Game of Thrones campaign won two awards – a gold and a silver – at the Cannes Lions International Festival of Creativity. Email “Game of Thrones helped Ireland reach over one million US visitors last year”. Feedback on “Game of Thrones helped Ireland reach over one million US visitors last year”.